New research report names PetSmart the top online store brand for pet supplies, earning a brand health score of 725 out of 1000, followed by Petco at #2, PetFoodDirect at #3, Jeffers Pet at #4, and Pet Food Express at #5. 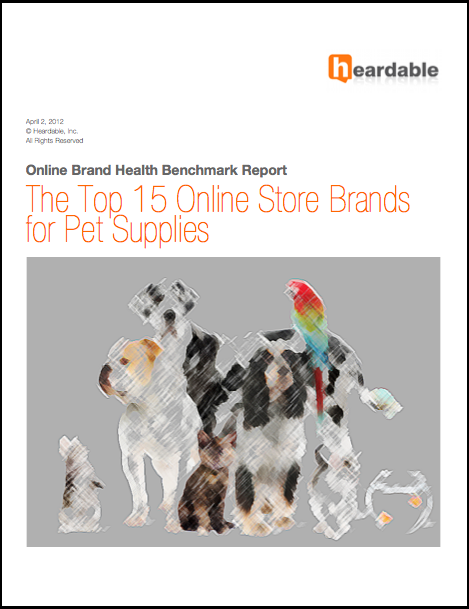 Heardable, the standard for measuring online brand performance, just released a new benchmark report titled, "The Top 15 Online Store Brands for Pet Supplies," and PetSmart (http://petsmart.com) outscored 14 competitors to be crowned the most effective pet supply store online. PetSmart outscored leading brands such as Wag.com, Drs. Foster And Smith, Mr Chewy, and Petflow to secure the top position, which was calculated by a thorough examination of online shopping sites and 779+ data variables per brand. PetSmart's score of 725 out of 1,000 beat its nearest competitor, Petco, by 14 points (1.93%). The gap between PetSmart and lowest-ranked UPCO was 349 points, or 48.14%. "PetSmart is doing a great job balancing its business interests with brand outreach," said John Sharp, co-founder of Heardable, Inc. "It's been able to differentiate itself in this highly competitive business sector by offering a wide variety of content and an Internet shopping experience second to none to meet the demands of its fan base. That effort is being rewarded with positive word-of-mouth, customer loyalty, and strong sales." Jon Samsel, CEO - Heardable, Inc.